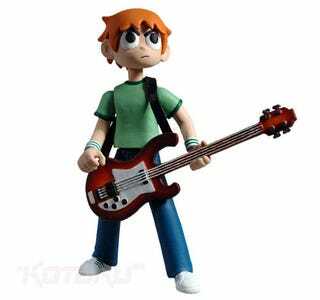 Having starred in his own motion picture and video game, comic star Scott Pilgrim is now rendered in small plastic form, ready for you to take home and...do whatever you want with him. Going on sale next April (!!! ), there will be two figures available, one in a t-shirt with a bass guitar, the other in a winter jacket with a katana. We'd have loved a Paul Robertson-looking one from the game, but hey, life isn't always fair, let alone perfect.